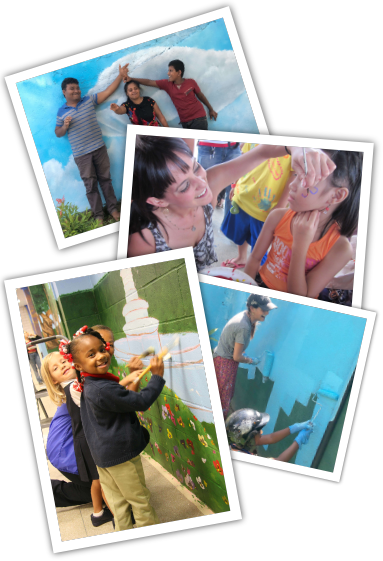 About Us: Big Sky Countries is a non-profit organization founded in 2008 whose main focus is donating large-scale murals to children's facilities around the world. Since 2006, murals have been painted in Thailand, Ireland, the Philippines, Bolivia, New Orleans, Costa Rica, Atlanta, and all over the Los Angeles area. These children's facilities include elementary schools, orphanages, children's hospitals and youth centers. Murals range from 15 feet to 100 feet and just keep getting bigger! Everything is Donated: Supplies, Paint, Sketches, Travel and Time are all donated...The facility just needs a large clean wall and a ladder! Murals: At Big Sky Countries we take pride in our murals. Every project is treated as a masterpiece - Whether it’s a stark white wall in an orphanage therapy room, or a plain brick wall in an elementary school cafeteria…Big Sky Countries will make it a masterpiece! Each mural is custom designed for the space and carefully planned, incorporating "personal touches" and details that are unique to every facility. From ideas and research, to preliminary sketches, project execution and the final details, we work closely with each facility every step of the way. Theme: Each facility gets it’s own theme for their mural. For example: “Barrio Fiesta” (Philippines), “Music and My Favorite Activities” (Thailand), “Blue Bayou and Playgrounds” (New Orleans), “My Safe Place” (Los Angeles) and even “Under the Sea” in Ireland. Extensive research goes into picking the “theme” for each mural, with themes honoring the flora, fauna, culture and people of the region. Participation: Staff and children at each facility are highly encouraged to participate, giving their thoughts and ideas of what they’d like to see incorporated into the mural. In many of the murals, children drew pictures beforehand of their ideas, which were later incorporated into the final piece. 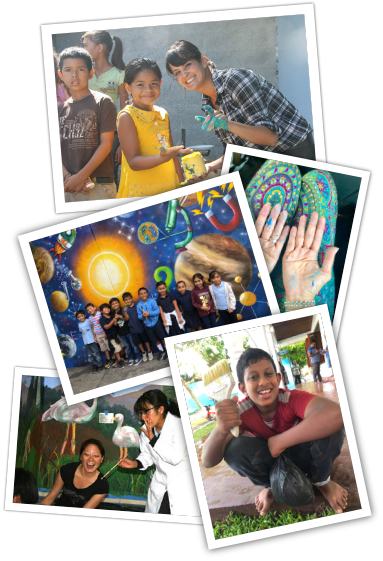 For example, In the Los Angeles mural over 50 drawings and paintings from the youth at the facility were combined to make the large 40ft mural. In many of the murals, the children from the facilities have been painted right into the murals, as seen in Thailand, Bolivia and the Philippines. All children, faculty members, and well, everyone is encouraged to paint. Big Sky Countries also donates scholarships, art supplies, art classes and other related materials to schools and children’s facilities around the world. Long Beach, CA (May 2005) - In 2005 Nichole donated a 15-foot mural to the Starview Foundation, a facility in Los Angeles for troubled children and teens. Palos Verdes, CA (2006) - In 2006 Nichole donated another mural to the Palos Verdes Montessori School for their International Children’s Festival. Redondo Beach, CA (2007) - Redondo Union High School “Ron Kooper” Art Scholarship - Nichole Blackburn donated a $1,000 scholarship to a student who was going into college to study Fine Art. Nichole’s mother matched the amount with another $1000 scholarship. Redondo Union High School was not only Nichole’s alma mater, but Ron Kooper was her influential art teacher. Hermosa Art Walk (2010) “Featured Artist of the Year” - Nichole Blackburn was chosen as the featured artist of the 2010 Hermosa Art Walk. Located on the lawn of the Hermosa Civic Theatre, the Hermosa Art Walk is a huge community event bringing hundreds of fine artists and visitors together for a weekend of fun. Nichole painted a 40 foot live mural depicting the local lifestyle of Hermosa Beach, including the surf and beach community. Children and adults were encouraged to paint with Blackburn on the large mural, which was later donated to an inner city children’s group. Every Monday Matters Foundation with Forest Whitaker (2010) - On behalf of Big Sky Countries, Nichole Blackburn donated her time and supplies to the “Every Monday Matters” event at Smashbox Studios in West Hollywood, CA. During the event Blackburn had participants “create” their own mini canvas painting, depicting the question: “What matters to you most?” This was a premier fundraising event that brought celebrities, companies, athletes, and families to raise much needed funds to bring Every Monday Matters programs to schools. The goal of this program is to empower youth through service-learning/ community outreach, character development, and establishing an understanding of significance and purpose. Hermosa Beach (2011) - Summer “Concerts on the Beach” - Nichole Blackburn donated four 15foot murals during “live painting sessions” for the Hermosa Summer “Concerts on the Beach”. Children and youth were invited to paint and participate with Blackburn in this community event with themes ranging from “aquatic” to “pop art”. 2012 and 2013 Manila Orphanage Visit and Party - Big Sky Countries brought volunteers and family together to re-visit the Nayon Kabataan Orphanage, which was where a donation mural was completed by Big Sky Countries in 2007. During both of these recent visits, the children and youth were treated to a day of fun featuring: a hip-hop dance instructor, face painting, games, and a party lunch including local favorite fried chicken, rice and bottled water. Most importantly, the kids were allowed to be kids!